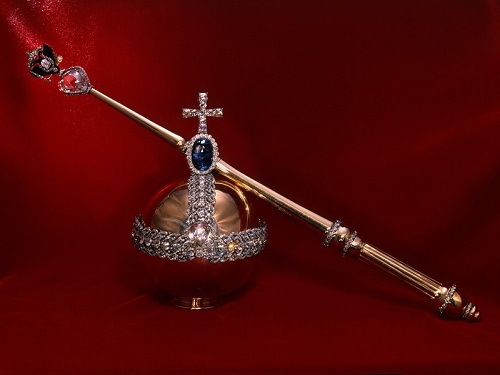 Located in Moscow Kremlin, Diamond Fund of the Russian Federation – part of the State Fund of Precious Metals and Precious Stones of the Russian Federation. 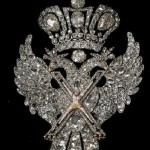 The collection of unique nuggets of precious metals and unique gemstones that have historical and artistic value, and a collection of unique jewelry and other items made of precious metals and precious stones, was founded by emperor Peter I of Russia in 1719. 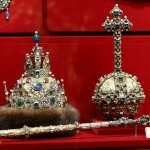 Tiaras “Russian Field”. 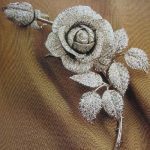 Gold, silver, diamonds. 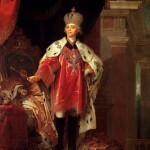 Master Nikolaev. 70s of the twentieth century. 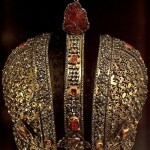 Imperial Crown of Russia – the main symbol of the power of the Russian monarchs, and a masterpiece of jewelry world. 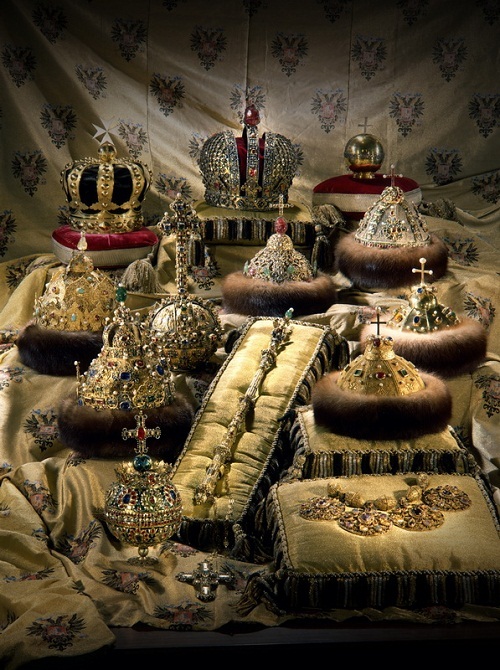 Imperial Regalia from 1762 to 1917. 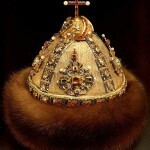 Great imperial crown crowned all the emperors from Catherine II the Great. 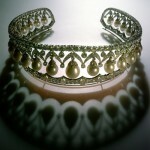 Crown – a masterpiece of world jewelry art. 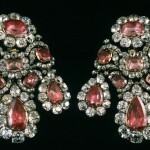 In the early 70-s of XVIII century power was decorated with two stones, having changed its overall look. 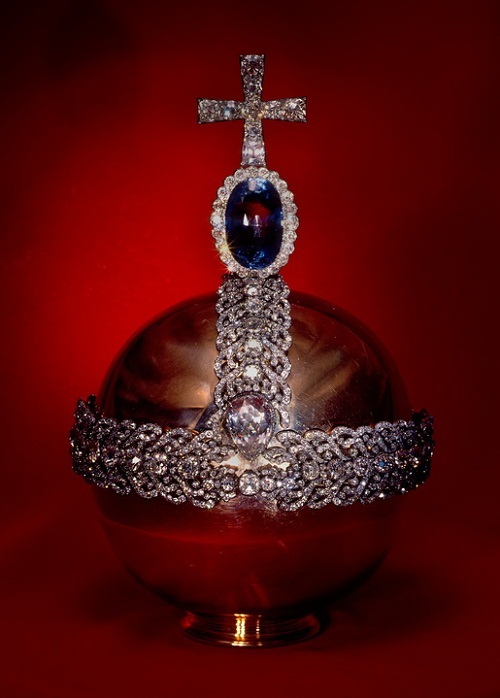 Between openwork diamond cross was placed a huge sapphire surrounded by diamonds weighing 200 carats, and on a belt – a large diamond weighing 46.92 carats, perfectly clean stone with a bluish tint. 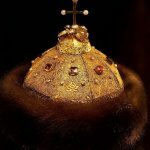 In preparation for the coronation of Catherine II, only two weeks before the important event, it turned out that the precious stones from the Derzhava of Empress Elizabeth had been removed, and gold – “went for business purpose”. 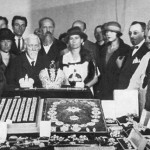 In an unusually short period of time the court jeweler Eckart made a new Derzhava. 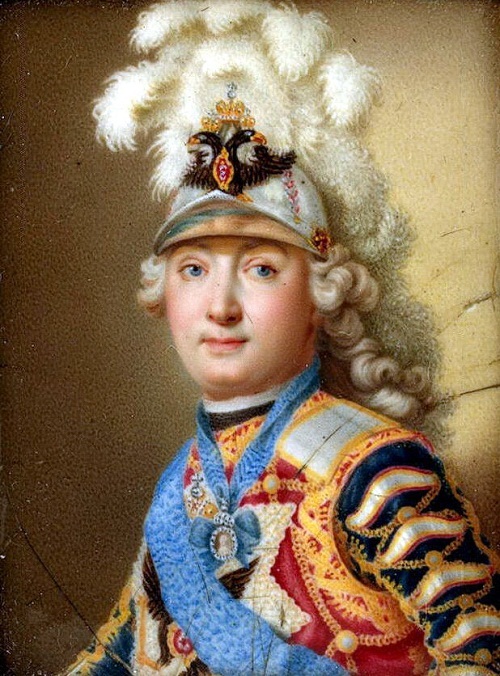 Heinrich Buchholz (1735-1781. 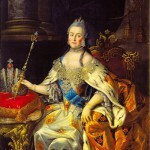 Portrait of Empress Anna Ivanovna. 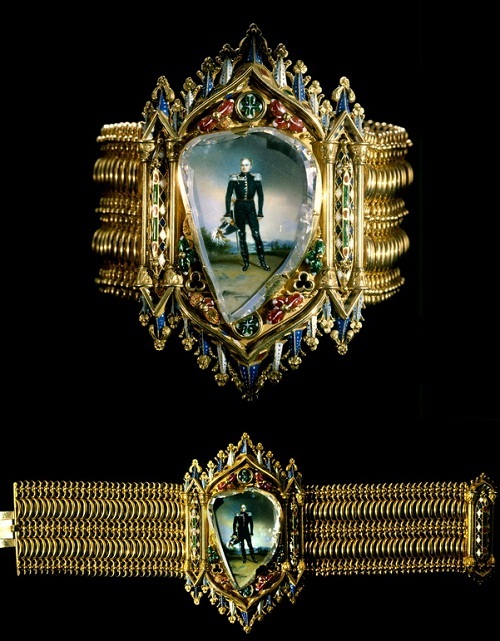 In the form of a small ball with a perfectly polished gold surface, on a low profiled based power gave the impression of luxury products thanks to diamond-studded belt and a cross on top. 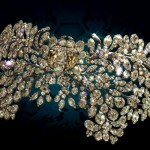 These diamond garlands were taken directly from the dress of Catherine. 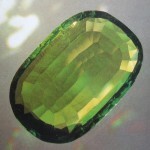 Rare beauty and color of stone weighing about 255 carats, probably brought from Burma, unusual faceted shape of the bunch. 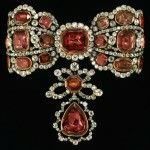 Tourmaline was presented to Catherine II the Swedish King Gustav III in 1777. 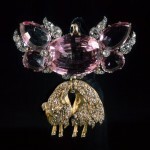 Its weight – 136.25 carats. 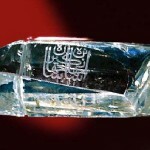 With rare purity “Emerald Table” can’t be competed by any stone in the world. 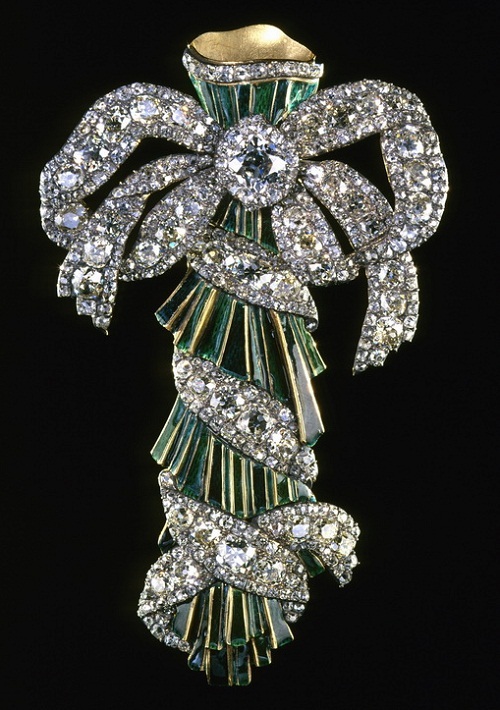 But there isn’t any records in the archive, which would reveal its past, as well as the name of the master who had made the elegant brooch with diamonds. 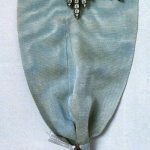 We only know that the brooch is made at the beginning of XIX century to the Grand Duke Konstantin Pavlovich, the successor of Paul I.
Portbuket attached to the bodice with large studs. Hollow inside, it served as a miniature vase for flowers. 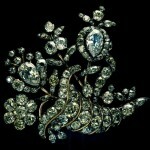 It is the largest portrait of diamonds that has ever been used in the world. 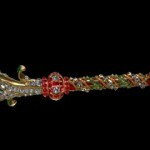 Stone of rare beauty and purity. 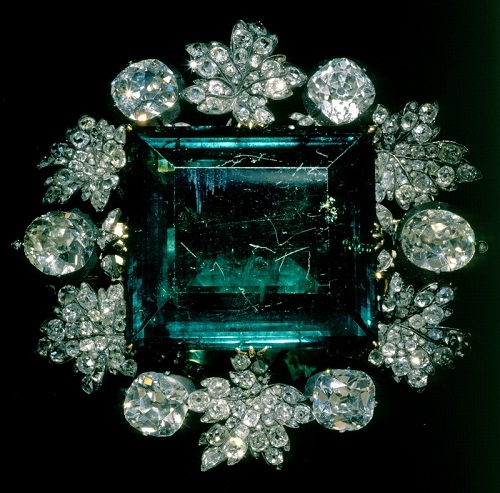 In the past, a significant part in the creation of the Diamond Fund took Jeremiah Pauzie court jeweler who worked for Elizabeth and Catherine the Great – two avid collectioners. 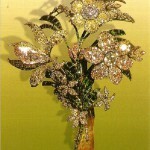 For Elizabeth, he created a series of colorful bouquets of Brazilian diamonds, emeralds, pearls, crystal and gold. 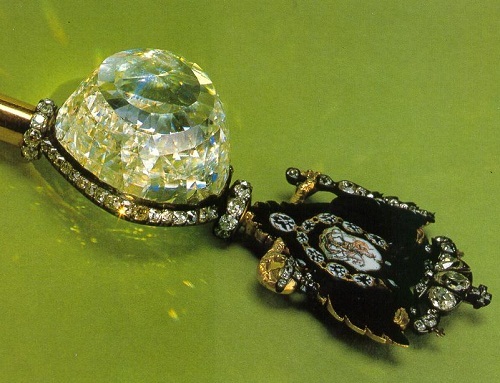 G. Orlov hoping to win back Catherine II on the day of her birthday November 24, 1773 (old style) gave the Empress a precious diamond. 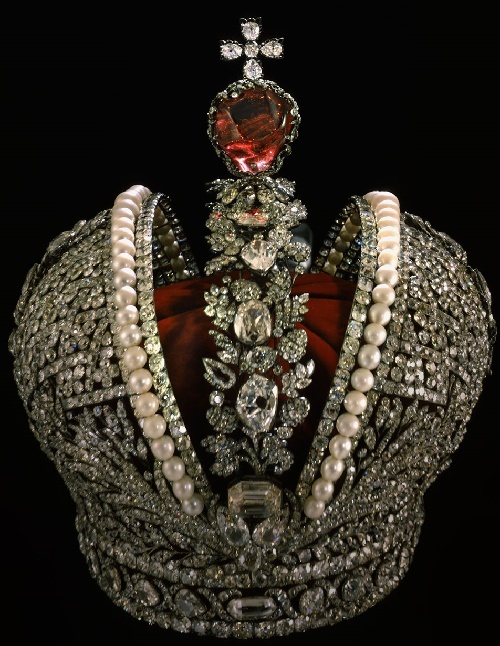 Prince von Solms, the Prussian ambassador to Russia, in 1773, reported to his emperor on the celebration of the birthday celebrations in honor of Catherine II: «Among the gifts presented to the queen was stunningly beautiful large diamond, a gift of Count Grigory Orlov”. Hat of doll Pandora. 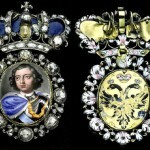 Diamonds, emeralds, rubies, gold, silver, enamel 8 x 6.5 x 4 cm, 1770s. 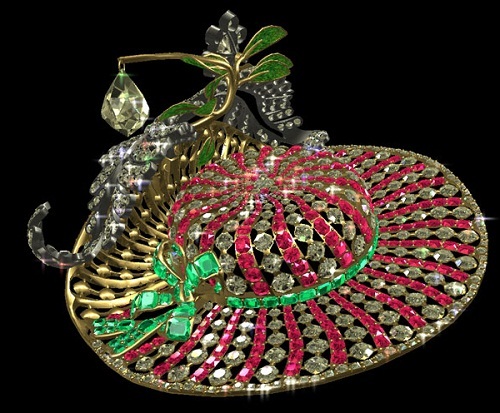 This hat – a miniature model of ladies fashion of 1770’s. 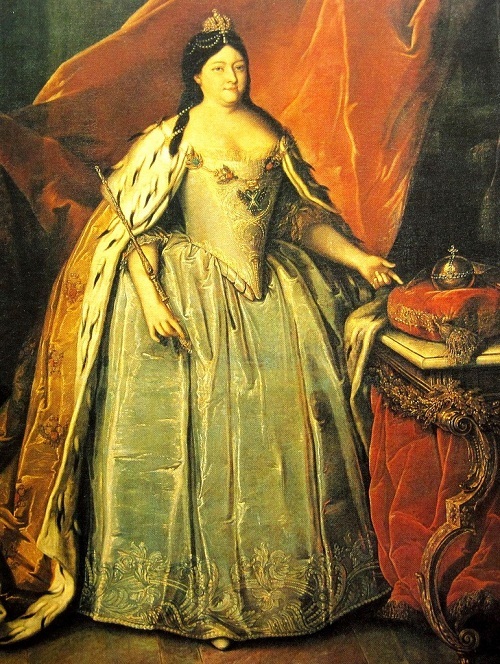 Since fashion magazines have appeared in Russia only in the late XVIII century, before the court ladies used to select outfits of dressed dolls, which became known as “Pandora”. In Greek mythology, there is a legend that the gods created the beautiful Pandora, to avenge their irate people. 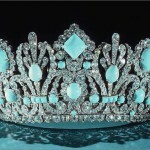 Hephaestus molded her out of the best clay, Athena dressed in luxurious silver dress and topped with a golden crown. According to the plan of Zeus, the beauty was to bring people to misery, temptation and ruin. And so it happened. 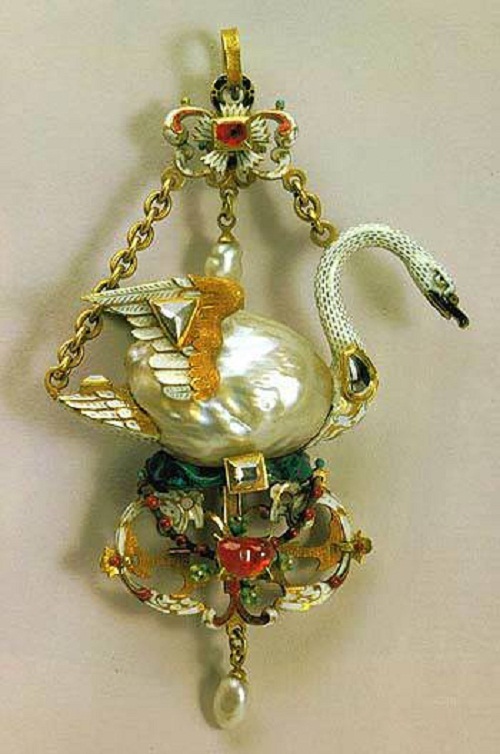 Doll Pandora carried temptation of secular fashionistas, and ruined their fathers and husbands. 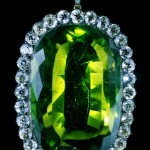 260 carats of exceptional purity and brightness of the stone. 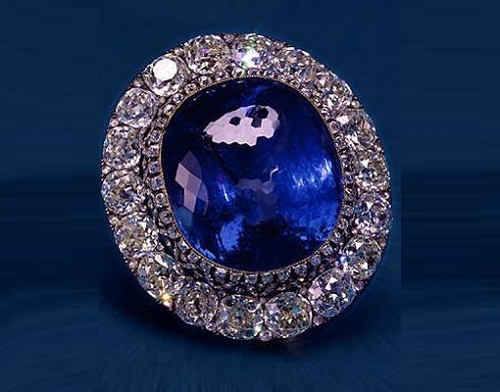 “Ceylon Sapphire” in 1862 acquired Alexander II at the World Exhibition in London as a gift to his wife – Empress Maria Alexandrovna. 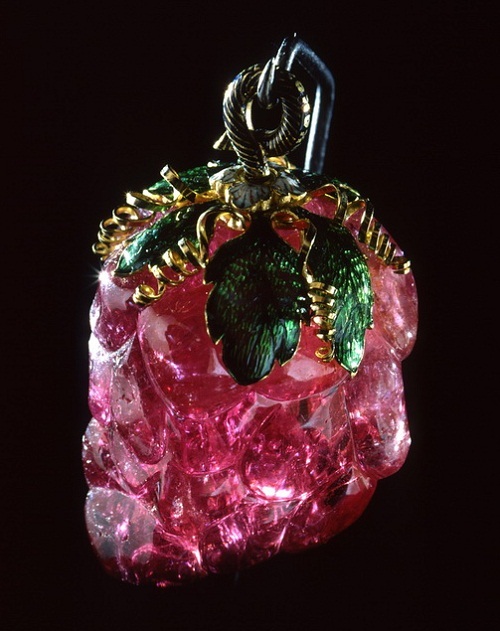 According to one version, it is one of the big pieces of stone “Great Mogul”, originally weighed 400 carats after cutting – 189 carats. As the story goes, the diamond has long been the third eye (located between the eyebrows), of the statue of Brahma temple in Seringapatam. 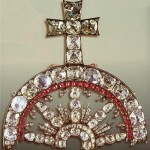 Traces of the famous diamond to the time lost, until it got to the Armenian merchant Grigory Safras. 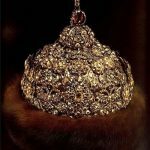 In 1767, he put the diamond in the Bank of Amsterdam, and five years later sold the stone for 125 000 to the nephew of his wife, the court jeweler Ivan Lazarev, who sold it to Count GG Orlov for four hundred thousand rubles, a lifelong pension of two thousand and of nobility. 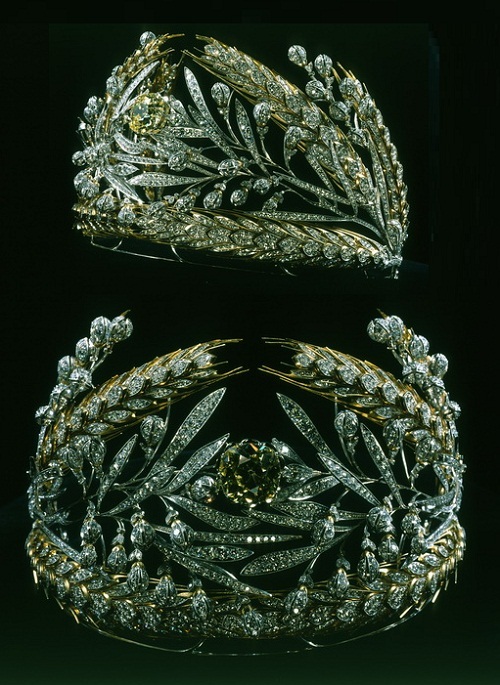 Crown of Empress Anna Ivanovna, the 1730-1731 Master Gottlieb Wilhelm Dankel. 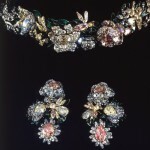 Jewelry set of Catherine II. 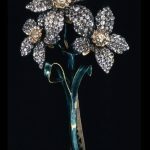 Silver, diamonds, spinels, gold. 11.5 x 11 cm 1764. Master Leopold Pfisterer. 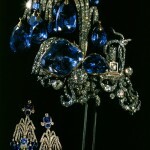 Paryura Banteay SKLAVAZH and earrings of Catherine II. 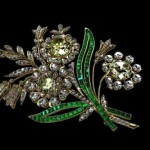 Silver, diamonds, spinels, gold. 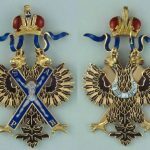 11.5 x 11 cm 1764. 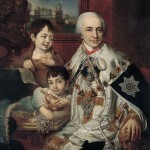 Master Leopold Pfisterer.